Charith Amarasinghe, Associate Director Business Development at Efic, is no stranger to helping Australian fashion businesses get the finance support they need to take on international growth. Working closely with Australian industry leaders he’s seen what it takes to become an international success. In line with their recently launched free eBook, Efic, Australia’s export credit agency, outlines 4 tips to help your business take on the world. A expert tips for fashion labels wising to export into Japan! The Australian Fashion Council has officially wrapped up its Designers Abroad London Showroom 2018, supported by The Woolmark Company, UK Department for International Trade (DIT), British Airways, Department for Foreign Affairs (DFAT) and AMP Capital. On Saturday 17th February, the AFC and KITX held an intimate cocktail reception at Australia House in London to celebrate sustainability in fashion and the AFC Designers Abroad London Showroom. The event was co-hosted by Kit Willow of KITX and renowned stylist Rebecca Corbin-Murray, along with AFC Board Director and Editor-in-Chief of Vogue Australia, Edwina McCann. The evening also featured special guests The Hon. Julie Bishop, Australian High Commissioner for the United Kingdom, Mr. Alexander Downer, and fashion designer & British Business Ambassador, Anya Hindmarch. The evening featured an Australian inspired menu by Kiwi & Roo paired with a selection of Handpicked Wines, which included a Romance Was Born x Handpicked Rose collaboration. Guests caught a glimpse of the new collection by KITX in collaboration with The Woolmark Company, featuring fine Australian merino wool and displayed on Bonaveri biodegradable mannequins. The evening also marked the opening of the AFC Designers Abroad Programme for London Fashion Week, supported by The Woolmark Company, UK Department for International Trade, Department for Foreign Affairs, AMP Capital and British Airways. The five day showroom at London Fashion Week was hosted at 180 The Strand from February 16 to 20 and featured Pared Eyewear, Manning Cartell, We Are Kindred and the 2016/17 International Woolmark Prize womenswear regional winner for Australia/New Zealand, Harman Grubiša. 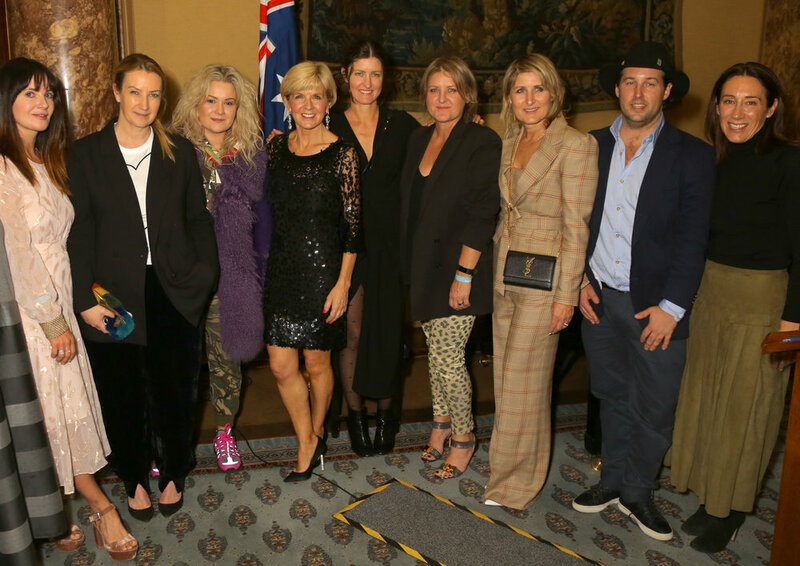 The showroom was the seventh Australian Designers Abroad event, previously held in Paris and New York, attended by a variety of global retailers, media and industry players. Launched by the AFC in 2015, the initiative strives to build the profiles of talented Australian designers during international fashion weeks, cementing reputations and growing stockists aboard. Previous showrooms have been held in the fashion capitals of Paris and New York. To find out more about the designers who were on the programme click the button below, and stay tuned for our editorial shot on the streets of London via our Instagram @AusDesignersAbroad. Designers Abroad is supported by the Australian Government through the Australian Cultural Diplomacy Grant Program of the Department of Foreign Affairs and Trade (DFAT). Creative Victoria are undertaking the first comprehensive survey into Victoria’s fashion industry, if you work in fashion or a related industry then they want to hear from you! The more they know about the industry – the better they can support it. Looking to host events in Melbourne next year? The City of Melbourne's Event Partnership Program (EPP) is now accepting applications for events in the first half of 2018. GISP is seeking expressions of interest from QLD manufacturers in Fashion & Textiles. So often we hear about skills shortages in industry, about our ageing workforce and the threat of no new workers stepping up to fill these spaces. GISP is an exciting new project for QLD that will assist in building awareness and pathways into our industry for current high school students. TFIA was recently contacted by The Australian Competition and Consumer Commission (ACCC) to invite you to participate in a survey about how they carry out their work. TFIA has been informed by the ACCC that five updated guides for business and legal practitioners on the Australian Consumer Law (ACL) are now accessible. These guides are now easier to read and feature case studies. The Australian Government has imposed prohibitions on all air cargo that has arisen from Bangladesh. This came into force on the 19th Dec 2015 and will remain in place for the foreseeable future.